Blaine Anderson is now an Emmy winner...and that's what you missed on Glee! Darren Criss won his first-ever Emmy on Monday night at the 70th Annual Primetime Emmy Awards for Outstanding Lead Actor in a Limited Series or Movie for his work on The Assassination of Gianni Versace: American Crime Story. "Oh, my god, you guys are witnessing the most extraordinary moment of my life thus far. So this is pretty cool," Criss said after taking the stage. 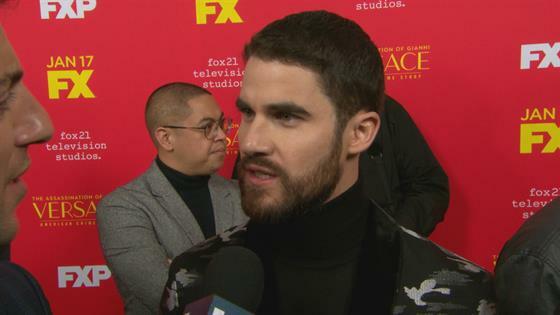 After becoming the breakout star of Ryan Murphy's Glee, he thanked the uber-producer (who took home the prize for Outstanding Directing for a Limited Series or Movie) for giving him a chance to take on the role of Andrew Cunanan, the serial killer and sociopath who murdered Versace, in the hit FX series. "Actors are only as good as the moments they're given and granted. I'm so profoundly indebted to my friend Ryan Murphy for entrusting me with this opportunity of a lifetime and for believing in me," the 31-year-old said. Criss went on to thank Mia Swier, his fiance, saying, "To my darling Mia, you roll the windows down and pump the music up in my life and I'm so thankful for you. I'm so lucky to have you." Criss beat out Antonio Banderas (Genius: Picasso), Benedict Cumberbatch (Patrick Melrose), Jeff Daniels (The Looming Tower), John Legend (Jesus Christ Superstar) and Jesse Plemons (Black Mirror, "USS Callister") to take home the award. "I am so very privileged to be in this room among so many people that inspire the living crap out of me," Criss said on stage. "And I am so honored to be nominated. A lot of you guys I have been a fan of for such a long time." He also thanked his family for giving him a childhood so unlike the one Cunanan grew up in. "Mom, dad, Chuck, unlike the character I played, I was lucky enough to be raised in a home that was very loving and emphasized the value of hard work and compassion and not taking yourself seriously," he said.